Thu, 27/11/2014 - 13:44 Astri N.
At Aldebaran, our developers and engineers are working hard day after day to improve our robots. This upgrade takes into account your feedbacks and is fixing the most pressing issues. It also improves functionalities and modules in order to have a better interaction with the robot. Moreover it brings additional features that you should appreciate. From the NAO Web Page, you can now connect NAO behind a proxy. You can also choose to enable or disable the Autonomous Life at the robot’s startup thanks to the new parameter: “Alive by default”. We have also added a channel system grouping applications to install in one package, with dynamic updates. The Basic Channel compiles all needed applications for a first experience, including NAO’s dialog ability, falls recovery and Autonomous Life that allows to launch applications using a voice interaction. Webots 8 for NAO, which is compatible with Choregraphe 2.1.2 and NAO V5, will soon be available! For those who don’t know, Webots allows you to launch a virtual world where you can control a simulation of NAO. This is really useful to try your own developed apps or animations without damaging your own robot! In order to improve the interaction we migrate from ACAPELA to NUANCE speech engine for English, French and Chinese. This will help NAO to have a better voice quality and voice recognition. We have also fixed up a collision bug to restore the walking abilities. We are working on several other remaining issues and more improvements are on their way. 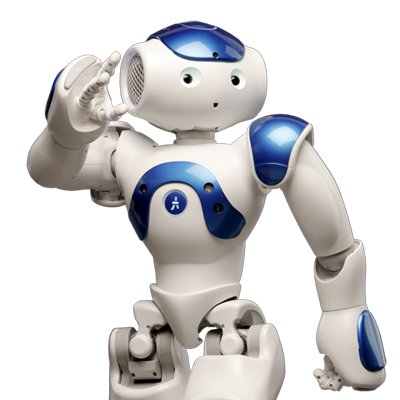 Our teams are dedicated to offer you the best interactive robot which will propose you a richer experience. So thank you for your confidence and please, don’t hesitate to share your development’s ideas or any issues you encounter. This allows us to investigate, find solutions and improve NAO. One more thing: Don’t forget to have fun with your NAO! To dowload the new version, it's here! For more informations, have a look to our documentation.